As sightings of secret development models on the road increased, Rolls-Royce Motor Cars unveiled 200EX, the experimental forerunner to Ghost, at the Geneva motor show in March 2009. An instant hit, 200EX bore the trademark Rolls-Royce design cues but in altogether more compelling fashion. It was a clear statement of intent. What the design team was seeking to create was a modern Rolls-Royce that achieved a new dynamism but remained true to its luxurious heritage. They had found inspiration in contemporary furniture, architecture and yachts but also in the spirit of the 1930s – that sense of adventure and endeavour – which they wanted to capture in the character of this new car. After the show, 200EX embarked on a world tour, during which further information about the forthcoming production model became available. It would be powered by a new 6.6 litre V12 unique to the marque, delivering 563 bhp with extraordinary performance figures. It would ride on an intelligent air suspension system offering peerless ride and dynamics. And it would be called Ghost. Following the overwhelmingly positive reaction to 200EX during its travels, very few changes were made in the transition to the production Ghost – a tribute to the remarkable achievements of Ian Cameron’s and Helmut Riedl’s design and engineering teams. In September 2009, the new Rolls-Royce Ghost was formally launched to the world. Ghost’s flowing lines are dominated by its majestic ‘Yacht Line’ styling. Large, uninterrupted surfaces flow between finely sculpted horizontal lines that provide definition. Together, the upward-sweeping sill line and low-cut roof create a powerful profile, almost as though the cabin has been pushed toward the rear. Powerful shoulders and flanks draw in sharply as they flow from the rear wings to the tail lights, while touches such as the optional chromed exhausts hint at Ghost’s more dynamic nature. 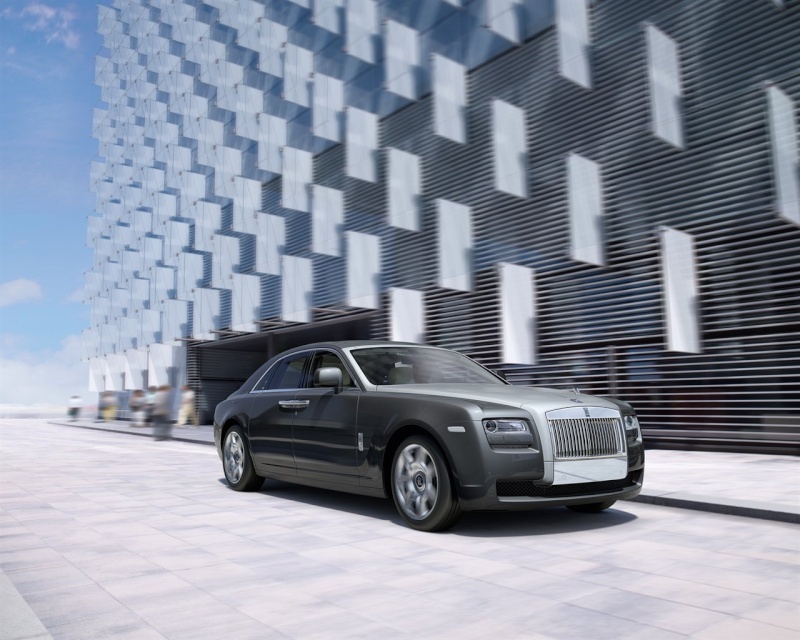 While incorporating classic Rolls-Royce design cues – the elevated prow, long bonnet, short front overhang, sharply raked A-pillar and elegant tail – Ghost exudes an informal aura. Contemporary touches include self-righting wheel centres and the Xenon headlamps that frame the latest evolution of the Rolls-Royce grille. Here the sides of the intake have been curved inwards and the vanes set back into the opening. “We wanted this to be less reminiscent of the traditional Parthenon style and more like a jet intake,” says Ian Cameron. A contrasting Silver Satin finish (introduced on 200EX) is an option for the bonnet, grille and windscreen surround. The finish is achieved by setting silver metallic paint under a layer of lacquer, giving a flawless matte finish. The central principle of delivering simplicity out of complexity runs throughout Ghost. Everything is designed, engineered and crafted to enhance the drive and ride experience, not to complicate it. Inside Ghost, the interior design team has come up with a contemporary ambience while staying true to Rolls-Royce Motor Cars’ traditions of fine materials and peerless comfort. There are elegant, frosted lamps and chrome door handles, traditional violin key switches and eyeball air vents, frosted white dials and refined instrumentation. Deep-pile carpets can be complemented by optional lambswool floor mats for a truly luxurious feel. Ghost is entered through substantial doors. Housed within the front doors are integrated Teflon-coated umbrellas. The rear doors are traditional, rear-hinged coach doors, opening to a generous 83 degrees. Once the passenger is inside, these doors can be closed at the touch of a button. The interior space is filled with natural light, enhanced by the optional Panorama Sunroof, which extends from the front into the rear compartment. Four-zone automatic air conditioning can be individually tailored to each passenger’s requirements, with separate controls for front and rear. Automatic air recirculation, condensation prevention and solar compensation are delivered through classic chromed eyeball vents controlled via organ-stop plungers. Within Ghost’s ample doors and high shoulder line, occupants feel serene, cosseted and safe. In the rear, the intimate ambience of the lounge seat is emphasised by its position behind the C-pillar, heightening the sense of privacy. The informal seating creates a convivial environment, its slight curve allowing you to turn more easily towards the person next to you. Its elevated position gives a clear view past the electronically retracting Spirit of Ecstasy to the road ahead. Individual lounge seating is offered as an alternative to the standard lounge configuration. This allows the addition of a massage function and also perforated leather for a cooling stream of air from the seat surface. Auxiliary rear climate control allows the passenger to regulate the temperature of the air on their side of the car, without intrusion on the other. A cool box with interior illumination and integrated champagne glasses is also available. Veneered picnic tables are another option, incorporating the finest leather and veneers matched to the rest of Ghost’s interior. Fitted to the rear of each front seat, these tables are a traditional Rolls-Royce design cue and finished with a veneered surface with leather-covered backs. Enhancing the Ghost ambience is an audio system delivering an exquisite experience. 600 Watts of sound are delivered through a 10-channel amplifier and 16 speakers, including two floor-mounted subwoofers. USB and auxiliary inputs allow for the integration of external audio devices and a 12.5 GB hard drive enables storage of music files from USB or CD player sources. Available as an option with both seating arrangements is Theatre Configuration, which allows all settings that do not directly affect the driver to be controlled from the rear seat. The functions are displayed on two 9.2in LCD screens in the back of the front seats; these can be angled to suit the viewers by a central, armrest-mounted, rotary controller. The screens can be regulated independently of each other and the entertainment can also be listened to individually with most headphones. A six-disc multi-media changer, mounted in the glove compartment, is fitted as part of this option. When considering a Rolls-Royce car it is usual to think of wood, leather and chrome, but the company has its roots in engineering. The refinement of its end product stems from its engineers’ desire to get the smallest details correct. Long before the interior items are prepared, experts are working to ensure that the chassis components, power trains and bodywork are operating in fluid harmony. This is a world where welds are an art form and craftsmanship exists at a nano level. Ghost is built around a steel monocoque body, which means there is no separation of chassis and body. The advantage of this construction is a reduction in exterior dimensions while preserving interior space. Consequently while Ghost is 400mm shorter overall than the Phantom saloon its interior space is comparable. The body has been engineered with a double front bulkhead to help insulate the interior from engine noise. It is constructed from steel sections and then wrapped in steel panels, which are brazed by hand. This allows a near-seamless join, which is then sanded by hand until it is perfect. In total, Ghost’s frame contains 4.9m of seam weld and braze and 6,988 spot-welds. The bonnet and windscreen surround are then honed from aluminium. Ghost rides on a bed of air. Double-wishbone front suspension and multi-link rear suspension work with an intelligent, four-cornered, air-suspension system and electronic variable damping to deliver the refinement that has been associated with Rolls-Royce for more than 100 years. The new air suspension system in Ghost is so sensitive that it can detect even the smallest of changes. For example, it will sense the movement of a single rear passenger from one side of the seat to the other and compensate accordingly. A complex computer system reads multiple inputs from sensors around the car; the dampers alone make individual load calculations every 2.5 milliseconds. This ensures not only perfect comfort but also precise steering and dynamics for the driver. The air suspension system also incorporates a lift and kneel function, raising or lowering Ghost by 25mm. Ghost also has a series of complex electronic aids to keep it composed on virtually any surface. These include Anti-Roll Stabilisation, Dynamic Brake Control and Dynamic Stability Control, including Dynamic Traction Control and Cornering Brake Control. These individual technologies work together under dual Integrated Chassis Management systems, meaning that even when subjected to a vigorous test Ghost remains perfectly poised. Its handling and safety systems operate as one, imperceptibly to the driver and passengers, to maintain optimum contact with the road in any condition. Ghost is powered by a brand new, 6.6 litre twin-turbo V12 engine, unique to the model. Featuring direct injection, it produces 563bhp – enough to propel Ghost from 0-60 mph in just 4.7 seconds* and on to an electronically governed top speed of 155mph. With 780 Nm of torque available at just 1,500rpm, delivery of power is immediate and extremely smooth. Safety remains paramount and the very latest technologies are used in Ghost. Side-impact beams in the front and rear doors combine with progressive rear crumple zones to absorb impacts. The Advanced Crash and Safety Management (ACSM) system takes measurements 2,000 times per second from sensors located around the vehicle. The ACSM uses this information – in conjunction with the engine and chassis management systems – to judge which safety features to deploy in which areas in the event of an accident. If necessary, ACSM will activate – among other things – seatbelt pre-tensioners and all encompassing airbags surrounding the cabin, creating a safe zone for all occupants. Ghost is the most powerful car that Rolls-Royce Motor Cars has ever produced. However, Rolls-Royce power is delivered in a very different manner to other cars. It arrives in an elegant, cosseting way that some have described as being designed to lower the pulse, not raise it. The principle of simplicity extends to the act of driving Ghost. The host of complex engineering software and technologies beneath the surface serve to make driving easier and more enjoyable, not to intrude or confuse. Ghost is more driver-focused than any Rolls-Royce car before it. The driver sits in a slightly elevated position behind the wheel, described as the authority position. This makes the view of the road much clearer. The fascia has been kept deliberately clear; it is spacious in design and has an intuitive layout. The controls are neatly sculpted, with the more important functions emphasised by accents of chrome. The soft light of the instrument panel glows through the familiar black-rimmed steering wheel, which in turn employs a number of violin keys as well as an ergonomic roller-ball control. The control centre display is concealed behind a veneered panel until its services are called upon. All features such as satellite navigation, telephone, communication and entertainment functions are displayed here and managed via a central rotary controller, flanked by quick-access buttons on the front centre console. The optional driver assistance systems and technologies in Ghost are notable for their discretion and ease of operation. From the moment the driver approaches the car, optional Comfort Entry** allows easy access, unlocking the doors when the key fob is within 1.5 metres and the cool chromed handle is grasped. Once you are in the car, voice control allows you to select from the control systems menus without using the central controller. For ease of manoeuvring, cameras located around the car serve a number of purposes. Rear, front side and top view cameras can combine to give a fish-eye view at blind junctions or provide ground images with obstacle recognition and reverse path prediction when parking. Positioned discreetly within the grille is a Night Vision** camera. When activated, this safety feature works with Pedestrian Recognition to detect objects up to 300 metres away and display them on the central screen in the dash. The car’s control system receives infrared heat images from the camera and, taking into account the car’s speed and direction, classifies them to assess imminent danger. It then determines what action, if any, needs to be taken and if necessary displays a warning to the driver. The Head-up Display relays crucial information such as speed or navigation directions onto the windscreen directly in front of the driver. This information is visible only to the driver and can be tailored to show only the details required and at a position suitable to the driver. Lane Departure Warning** alerts the driver should the car start to drift out of its current lane. When activated, it uses an integrated camera, located just in front of the rear view mirror, to monitor road markings and the vehicle’s position. The driver is warned by a discreet vibration through the steering wheel. If the driver uses the directional indicators before and after the lane change, the wheel will not vibrate. High Beam Assistance** automatically manages the operation of dipped and main beam lights while driving at night. When activated, the same camera used by the Lane Departure Warning system monitors the light from any source at the front of the vehicle and automatically dips or raises the headlights accordingly. Adaptive, directional headlights also improve illumination of the road ahead and adapt to the road conditions, be they rain or fog or simply when the car is making a turn. Active Cruise Control with Stop & Go** creates a relaxing driving experience, particularly on long cruising journeys, as action is not required when the car ahead speeds up or slows down, even when coming to a standstill. Active Brake Intervention** also allows hill descent at a constant speed and the car’s Curve Speed Limiter communicates with the car’s Dynamic Stability Control systems to reduce speed on bends if safety and comfort may be compromised. Rolls-Royce has a reputation for producing cars that transcend the mere automotive. There is a magic attached to the name, which stems in part from exquisite attention to detail and the fine materials used throughout. Passing through 60 pairs of hands, the production process involves more than 2,000 individual operations and takes at least 20 days to complete. Ghost shares the same paint shop as Phantom and spends seven days being painted and polished to perfection. Five stages are required for the Ghost body. First a phosphate electro-coat is applied to protect against corrosion, then a layer of primer, a colour coat and finally two coats of clear lacquer. The body is hand-sanded between each layer and once the final coat is applied it is hand-polished for five hours. Ghost is available in 12 exterior colours, each of which can be contrasted by the optional Silver Satin bonnet. Flawless leather is an absolute requirement for the interior of a Rolls-Royce. For this reason, our leather is sourced from bulls raised in pastures free of barbed wire, ensuring that there are fewer imperfections in the leather. Any other marks are carefully avoided by our skilled laser cutters. At least eight hides are used for an interior, and to ensure colour consistency, each hide comes from a batch dyed at the same time. The hides are drum-dyed rather than painted, ensuring that the colour permeates right through the leather. The process also means the leather remains much more supple, preventing cracking or squeaking and ensuring durability and longevity. All seats and interior panels are hand-stitched, using traditional upholstering techniques by those most skilled at their craft. The natural beauty of the veneers in Ghost is brought to life by the skill of dedicated craftsmen and women. The natural burrs and grains are chosen for their intricacy and interest: veneer specialists choose only the finest logs from which these very thin cross sections are taken. Only veneer from one tree is used in any car. This ensures not only that the grain matches throughout the interior, but that each area ages and colours at the same pace. The parts are milled and sanded by hand before being coated with five layers of lacquer for protection and a mirror-like shine. Ghost is a vision of simplicity – of taking the core values of Rolls-Royce and creating contemporary effortless luxury. Ghost has been engineered to ride and drive in peerless fashion. The chassis’ poise delivers a dynamically engaging experience for the driver, yet a serene, comfortable ride for passengers. Engine power is delivered in a manner which has become an engineering signature, seemingly effortlessly and endlessly. The latest in-car technology falls easily to hand while forming part of the background. Ghost embodies 21st-century Rolls-Royce: more than 100 years of engineering and design excellence expressed in modern and uncompromised style. Engine / No. of cylinders / valves p. cyl. Displacement, acc. to ECE Reg.